Congratulations on your engagement from the team here at Lisa Hoppe Travel Consulting! If you’ve already decided or even if you are just toying with the idea of a Sandals/Beaches WeddingMoon that’s great! A WeddingMoon is a phenomenal experience whether you’re eloping or bringing along guests. What Sandals/Beaches Resort Do You Want To Stay At? The first thing you will need to decide on is which type of resort; Family-Friendly or Adults Only. Beaches Resorts are for everyone with a special focus on families. Even if only one child will be attending your wedding, you need a family resort. Beaches is also great for weddings with a larger amount of single people attending. A group of people can choose to share a larger room to save on costs. There are three Beaches Resorts total – Beaches Ocho Rios, Beaches Negril and Beaches Turks & Caicos. Sandals Resorts are an adults-only and couples only haven. It’s the perfect venue for a couple eloping on a romantic WeddingMoon getaway or WeddingMoon sans-kids. Sandals has 14 resorts to choose from on various islands throughout the Caribbean. You’ll find only King Beds here since the resorts are geared towards Couples Only. Either is a fantastic choice. But no matter which one you go with you’ll need to figure out if you want a Legal Wedding or Symbolic Wedding. Will This Be A Legal or Symbolic Wedding? Having a legal wedding means getting legally married at the resort. This is the most popular decision made by wedding couples since it allows everything to be handled on property. You’ll need to bring proper documentation with you and abide by all that island’s marriage requirements. Legal weddings incur a government-imposed fee which is $95 in Jamaica, $288 in Antigua, $270 in Saint Lucia, $180 in Grenada, $325 in Barbados, $310 in the Bahamas and $400 in Turks & Caicos. If you wish to do a symbolic wedding then it must be a vow renewal. Sandals/Beaches calls their vow renewals a ReTie the Knot Ceremony. In this case you would have to get married here in the United States at the courthouse before you can be re-married at Sandals or Beaches. There are residency requirements in effect for all Sandals and Beaches resorts. You need to arrive on property a certain amount of business days prior to when the wedding can be held. Whether you choose a legal or symbolic ceremony, you still get the same dedicated wedding planning service. What Area Do You Want Your Destination Wedding At? Finding the perfect resort was the first step, but now you’ll need to decide where on property to have your wedding. There are garden gazebos, pier gazebos, beach venues or you could even say “I Do” on an off-shore island! It all depends on how you picture the big day. Do you want to be surrounded by lush greenery in the gardens? How about toes in the sand on the beach so you won’t need to worry about wedding day shoes? Does a ceremony on the pier right above the Caribbean sea sound perfect to you? Choose from any one of these options when you have a WeddingMoon at Sandals or Beaches! Reception? Cocktail Hour? Champagne Toast? So now the location for the ceremony is set. If you need a cocktail hour, champagne toast, cake cutting, private reception dinner or all of the above then Sandals or Beaches has you covered. Depending on size of the wedding party and the groups’ preferences, you may want a fully private reception with a D.J., dance floor and completely customized décor. Or you may just want a moment of congratulations with your loved ones and a champagne toast. 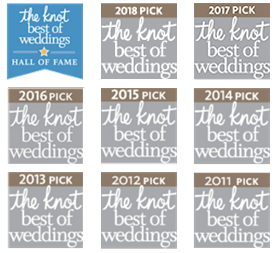 Your wedding coordinator will work with you to find the ideal post-ceremony option. A wedding day is about celebrating the love between the Bride and the Groom. However, if you’re bringing along guests then you should take time to consider their needs as well. We will work with you to discover the best way to book yourselves as well as your guests. Discounts can start as soon as you have 5 rooms booked with Lisa Hoppe Travel. Larger groups get even more specials like 6th/12th Room Free, A Free Honeymoon Room for the Bride & Groom and other great opportunities for your wedding group*. We can also block group space for you to ensure everyone in your party will be guaranteed a room for their stay in the fabulous Caribbean. Call (414) 258-8715 and speak with an agent or email [email protected] for more details. *Current promotions/specials are subject to change at any time. Many specials have strict requirements at time of booking. Often a certain number of rooms in a certain room category must be able to be verified prior to promotions being offered.